Druzy in all it’s glory…. 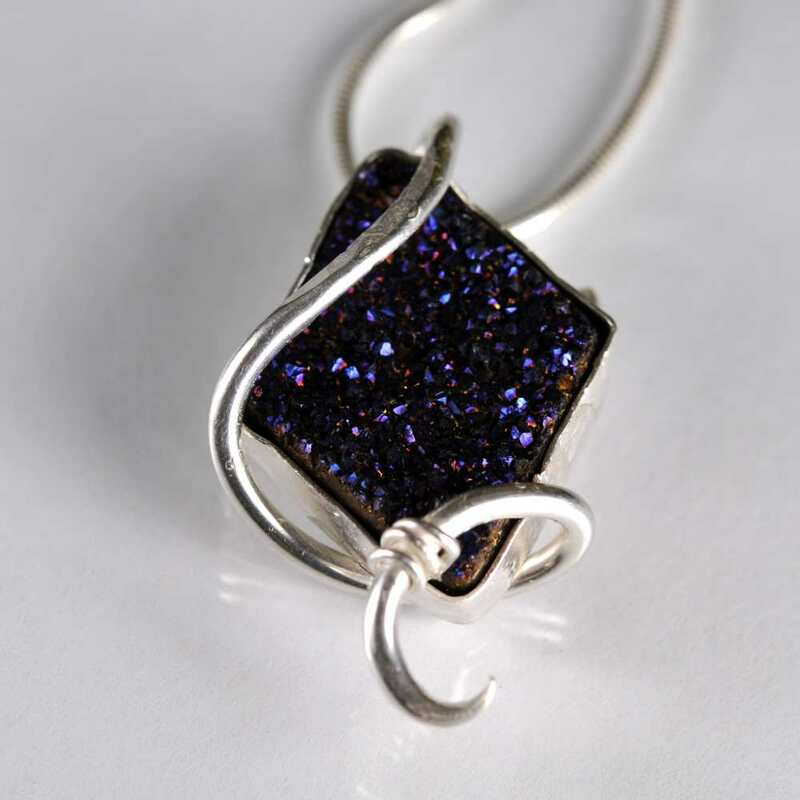 Forged Fine Silver Filigree around Black Druzy. Occasionally, however, the stone in question, while having excellent druzy crystal structure, lacks the beautiful colors that appeal to many people. In this case, a stone artisan will take the cabochon and a piece of mineral or metal such as silica, titanium, gold, or platinum and vaporize the mineral/metal which will then permanently deposit itself onto the surface of the stone. When using silica, the artist is depositing a stunning iridescent layer to the stone, like this stone above, but when using a metal like titanium, which is shown in the stone below, the stone artist can control the resulting coloration by the type and amperage of electrical current he uses to vaporize the metal. Some of the variations possible in titanium include blue, purple, gold, green, and every combination in between. Rose Gold Druzy Filigree set in 14 Karat with a white Sapphire accent. The vapor-deposited coatings of both minerals and metals are extremely durable, and will not chip or flake in any way. The only way to mar the coating is to abrade the surface crystals with directional force, such as knocking a ring against a table, or by cleaning the surface with a rough substance, like sandpaper or baking soda. I really love all things druzy, and even prefer it to many other cabochons and gemstones in my work. Every piece is hand cut, and custom colored, which I find only appropriate to showcase in unique, handmade, custom created pieces like mine. Hi, I’m not sure what kind of info you’d like. Can you be more specific?